The benefits of hiring a professional speak for themselves, but does it really matter if your choice is local? It certainly does. Here are the many reasons why a contractor from your own neighborhood is a cut above the rest. Right off the bat, a local business is quite literally invested in their community. They’re not some big national corporation or shady company from out of state who lack all the right licenses. When you hire a local contractor, you’re choosing a team that has roots in the same ground you do. It’s an empowering relationship for all concerned. Customers get the best possible service while the contractor further cements (pun intended) their standing in the community. It goes beyond this, too. A local professional understands every aspect of their job and that includes the legal and financial alongside the manual. Legal requirements for contractors vary from state to state. The companies who really care will know what’s needed for their locality and make sure they’ve got it. This tells a customer two important things at once. First, this contractor takes the law seriously. Second, they care deeply about their customers and their own reputation; an unqualified contractor sets their customers up for trouble just as much as themselves. Here in New Jersey, contractors need to carry insurance before they’re even allowed their license to start working. This is an excellent and disciplined approach which quickly presents the best available option to the client searching. It holds local contractors to a higher standard and protects everyone involved. The same goes for being bonded. A bonded contractor will be compliant with all local (as well as state) license laws. Since New Jersey contractors are all licensed at either the city or county level, bonds really show awareness and dedication to their home turf. Plenty of contractors will tell you they’re insured, and an uninsured one is easy to spot these days. Check out their website to see if they have their insurance details prominently displayed. If they don’t, they’re breaking the law and putting you at risk while doing it. All manual labor puts workers at risk. The right contractor will have worker’s compensation in place to protect their employees alongside other coverage like general liability and umbrella. As the name suggests, umbrella coverage protects them from a lot more than general does. Safety is of the utmost importance to us, which is why every Mikula Contracting operator is qualified under the strict standards of the Occupational Safety and Health Administration. OSHA (as they’re more commonly known) treats worker safety as an absolute priority and they set the bar nationally for contractors when it comes to looking after their team. It’s more than common sense and laws; a safety-conscious contractor makes sure their customers don’t foot the bill for workers injured on the job. We took an in-depth look at permits in our previous blog which are another benefit of hiring a knowledgeable local contractor. We’re also dedicated to keeping our local community as pristine as possible which is why we’re certified with the New Jersey Department of the Environmental Protection Agency. If you’re in the contracting business in New Jersey, you had better know about snow! Last year’s winter had many of us thinking we’d broken a record (but we had a long way to go). Any contractor can stay up to speed with our state weather via the web, but it’s only a local contractor who has the same experience customers do with ensuring your neck of the woods maintains business as usual. Snow can be a sudden hazard. It can box you in overnight and leave driveways, highways, and commercial sites crippled for days, weeks, or even months. New Jersey’s northern communities are often the hardest hit and that’s why we provide both emergency and ongoing snow plowing and removal services with our state-of-the-art equipment. Everything you’ve just read shows you why a local contractor beats the rest. 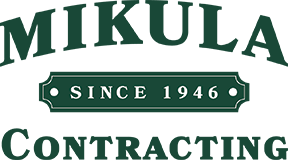 Mikula Contracting is fully licensed throughout the state of New Jersey and we’re adding to our 73 year-long list of satisfied customers every day. We can be there to get the job done no matter where you are in NJ.